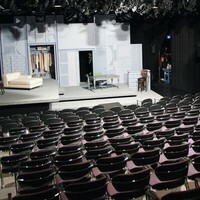 The Hertz Stage is the Alliance Theatre's second stage space. The decidedly underground 200-seat Hertz Stage introduces audiences to the best new voices in theatre with an experience that is up-close and intrepid. Since 1968, the Alliance Theatre has served as Atlanta's foremost theatre, working within the local, national and international communities to become one of the leading regional theatres in America. Parking: Parking is available at the following locations: (most event parking is $15 or less) - Woodruff Arts Center Parking Garage, located on Arts Center Way between 15th Street and 16th Street - Promenade Garage, located on 15th Street at the intersection of 15th Street and Arts Center Way - Colony Square, located at 14th Street and Peachtree Street - Midtown Plaza Parking Deck, located on Arts Center Way between 16th Street and West Peachtree Street MARTA: Take either the North or South line to the Arts Center Station. Follow the signs to the Woodruff Arts Center.